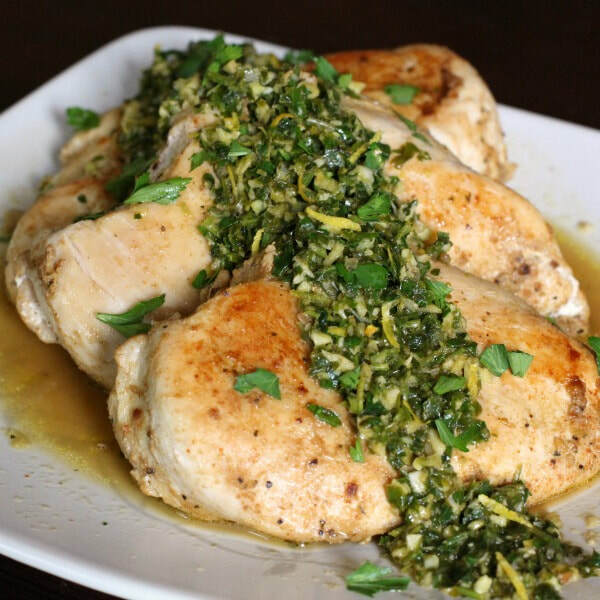 This Chicken with Garlic and Parsley recipe is SO simple and SO flavorful. Try it with one of our side dishes or on top of a salad! Sprinkle both sides of chicken breasts with salt, cumin and cayenne. Let sit 10-15 minutes. Add chicken breasts to skillet and cook until browned and cooked through, about 5-6 minutes per side. Chicken is done when the juice runs clear when cut through the thickest part. Transfer cooked chicken to a plate. Add garlic, parsley, lemon zest, lemon juice, and broth to skillet and cook over medium-high heat until warm, about 1 minute. Spoon sauce over chicken and serve.